Each May, OWAC hosts a reception to mark the end of its program year and give members and guests the opportunity to meet and socialize in a festive atmosphere. 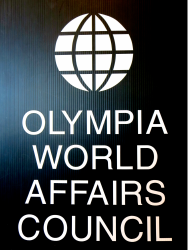 It’s also the occasion for the presentation of the ​​Global Connect Award, which recognizes an individual or organization for their contribution to connecting our Olympia area to the wider world. This year, we will be awarding our seventh annual Global Connect Award to The Alaffia Foundation, a nonprofit organization headquartered in the Olympia area whose mission is to empower African communities through the advancement of fair trade, education, sustainable living and gender equality. Click to visit The Alaffia Foundation on the web. The reception will be 6:00 - 8:00 PM on Thursday May 16th at the Indian Summer Golf and Country Club, 5900 Troon Lane SE, Olympia, WA 98501. The event is open to members and their guests, tickets are $35.00 for members and $45.00 for non members. Click the link at the bottom of the page to download the ticket order form.